“The Evolution of Maritime Art,” now at the Cotuit Center for the Arts, offers a beautiful and historical collection of maritime paintings dating from 1852 to 2010. 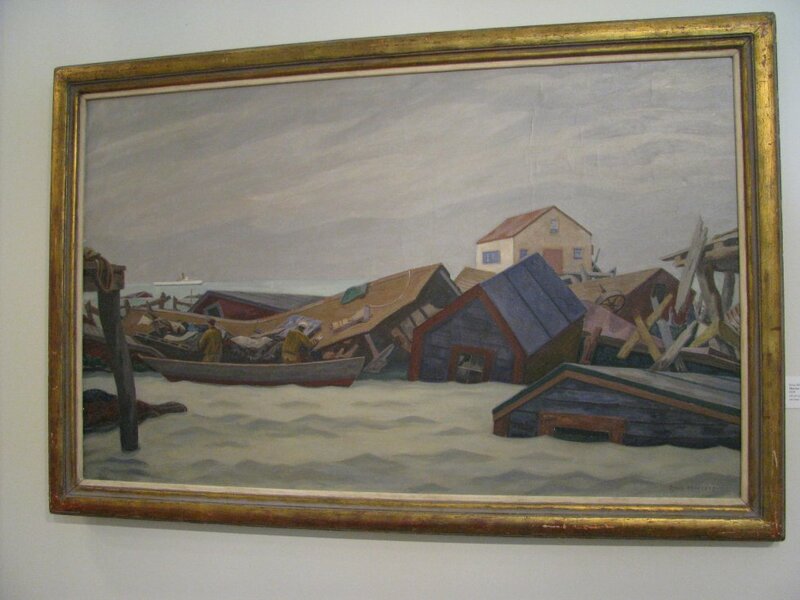 The exhibit is a collaboration between the Cahoon Museum of Art, the Cape Cod Museum of Art, and the Provincetown Art Association and Museum, all of whom loaned paintings, and the CCftA. Jamie Wolf, artistic director of the CCtfA, selected the paintings and arranged them in chronological order around the walls of the gallery, providing a journey through time and artistic style. 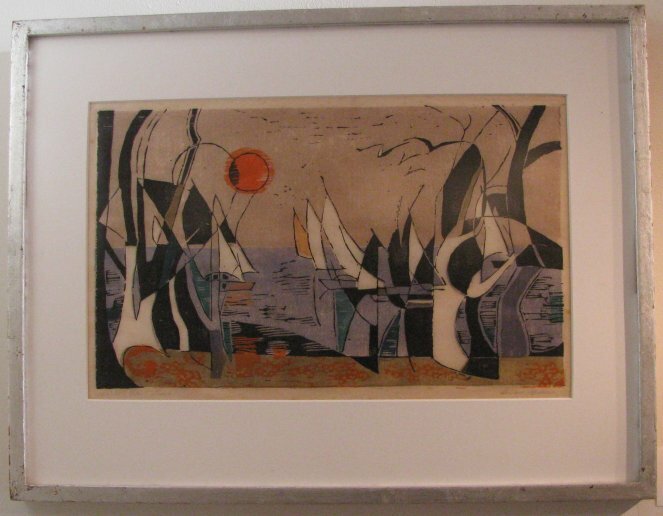 The show begins with classic realistic representations of ships at sea and includes American impressionism, expressionism, cubism, modern, and contemporary looks at the sea and the ships that sail upon it. There are peaceful seaside scenes and nautical disasters, graceful sailboats and work ships that have seen better days, solitary boats in the sunset and clusters of rowboats and ships, boats in safe harbors and in rough seas. The variety is rich and imaginative, and the journey is educational as well as visually appealing. The exhibit runs through April 24. The show was planned in coordination with the center’s production of “Treasure Island,” which runs through April 18, and it is a great accompaniment to the show–and well worth making a special trip to see. Contemporary artist Megan Hinton is featured in the exhibit, and I talked to her at the opening reception for the show on April 3. A resident of Wellfleet, she was happy to be included in the show, along with many well-respected maritime artists, including Ross Moffett, a painter she has been inspired by. 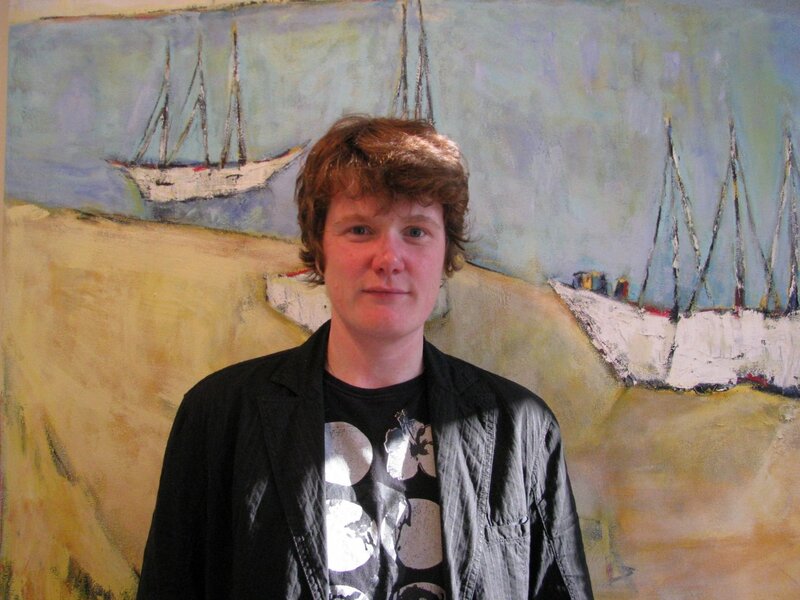 Megan calls herself an abstract representational painter, greatly influenced by painters of the mid-20th century, the 1940s to 1960s in the United States and Europe. She mentioned Nicolas De Stael (1914-1955), in particular, a Russian known for his abstract landscapes. “Barges Ashore,” her largest painting in the show (46 by 56 inches, oil on canvas), is of ships running aground, “an idea that is a little less cliche” than more common seascape views of Cape Cod, she said. She has sought to capture the tension in the scene and work with that, showing the influence of the tides, the boats, the shoreline, the human interaction with the water. Hinton works on several paintings at the same time because each one may take three or four months, as works on various layers. She works in high color, representing an abstract view of reality, preferring bright yellows against whites and blues, providing an emotional, expressive aspect to the work, intensifying the underlying tension. 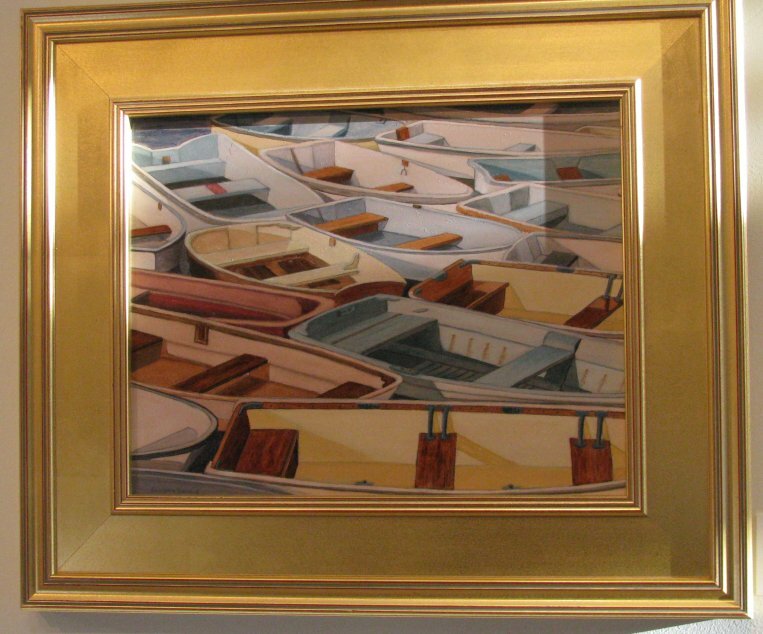 Megan talks more about her painting, “Barges Ashore,” her use of color ,and what she is trying to achieve in her work. 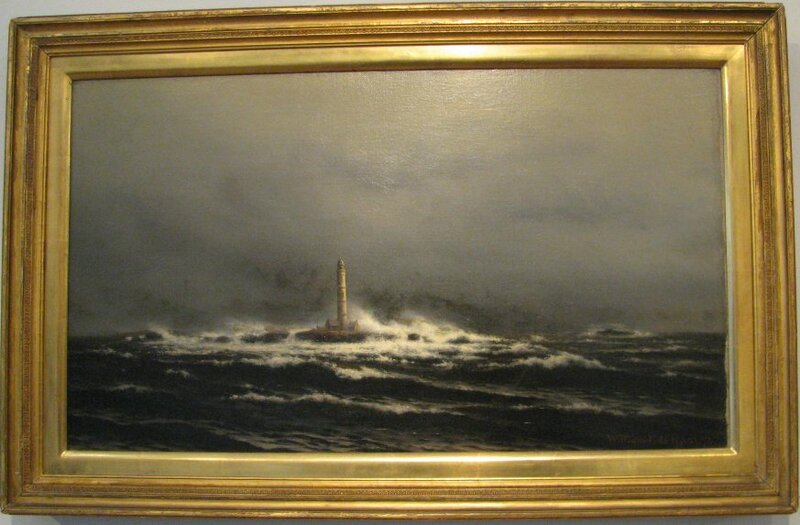 “A Dreary Day at Boon Island, Maine,” by William F de Haas, 1873, oil on academy board, Cahoon Museum. 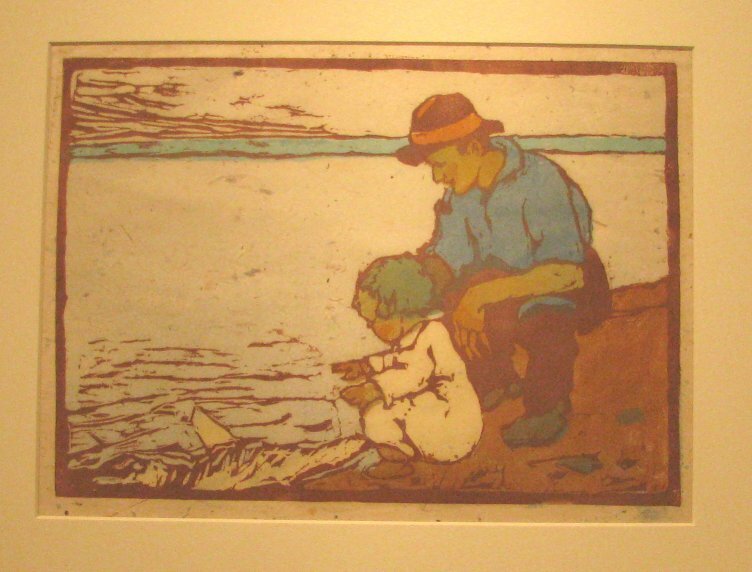 “The Young Yachtsman,” by Eliza Draper Gardiner, 1923, color linoleum block print, Provincetown Art Association and Museum. I am saddened to announce the passing of one of the finest marine artists in the world. The ship came in for Jeff Eldredge of Middleboro Mass. during the Christmas holidays. His ancestors journyed here on the Mayflower. He spent his life involved in every phase of the nautical world and he created an abundace of wonderful paintings. Truly a native son.